This fall inspired dish features the fruits of the season. 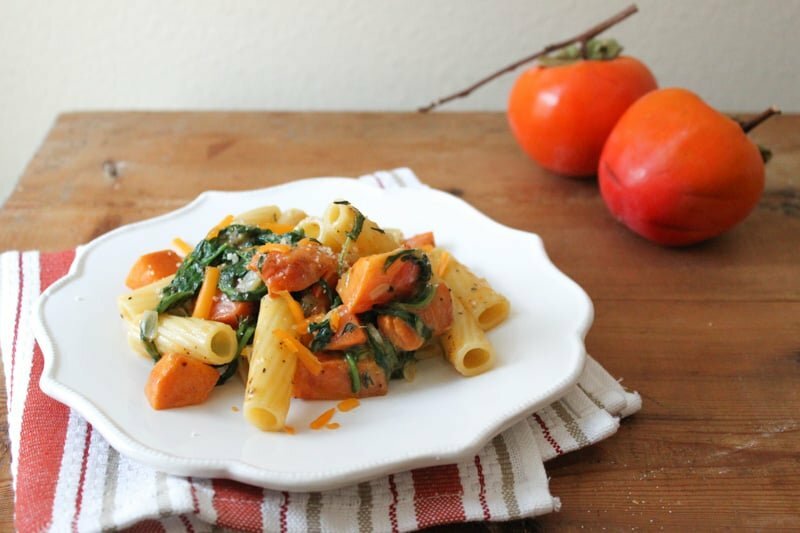 This persimmon arugula pasta is flavored with thyme, sharp cheddar, and parmesan cheese. I’m always curious about using fruits in savory applications. I associate fruits with desserts–pies, tarts, quick breads and puddings. My experience with persimmon is all sweet– persimmon bread, persimmon cookies, persimmon gelato. And then I thought, hey, why not cook it into a pasta dish?! Persimmons are my fruit of the moment. Every time I go back home to visit my parents, my dad gives me a grocery bag full of the fruit. I happily accept, especially because these babies go for up to $6 a pound at local farmers markets! My dad has both the Fuyu (flat, tomato like in shape) and Hachiya (elongated like a giant acorn) variety. Persimmons have a very delicate flavor. Its kinda difficult explaining how it tastes, but if you get a ripe one, its super delicious. Fuyu persimmon are commonly used in Autumn salads, but today I’m roasting it and tossing it into a cheesy pasta! I cut the persimmon into cubes and coat it in a little olive oil. I seasoned it with a sprinkle of salt and pepper and a pinch of fresh thyme, and then roasted it like you’d do with butternut squash. Half an hour later, I could smell the sweet aroma of the persimmon baking away. Rather than making a regular old mac-n-cheese, I put together all my autumn favorites– sharp cheddar cheese, caramelized onions, arugula and persimmon. I am so happy with the results. 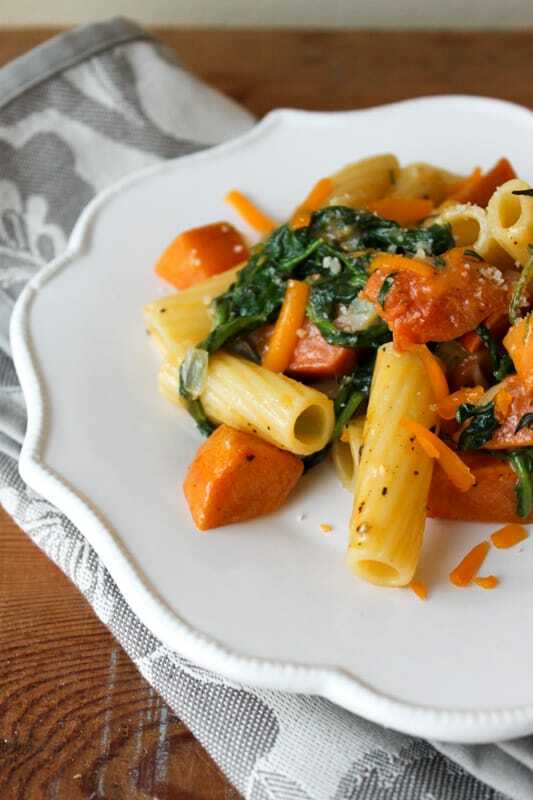 It’s my new go-to autumn pasta dish, especially because I still have pounds of persimmon waiting to be harvested at my parents’ house. 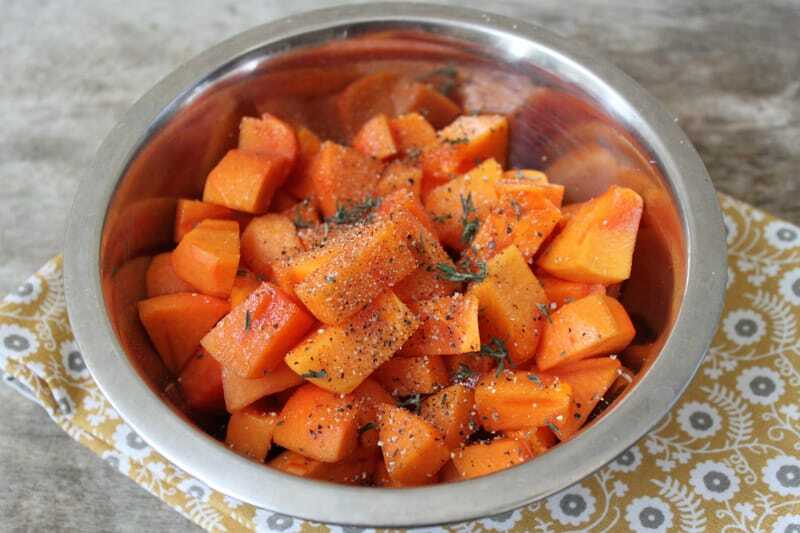 Preheat oven to 350 degree F. In medium bowl, toss persimmon cubes with 1 Tbsp olive oil. Season with salt and pepper and thyme. Toss to combine. Bake for 30 minutes until persimmon has softened slightly and can be easily pierced with a fork. Set aside and let cool. Bring a large pot of salted water to a boil. Cook rigatoni, or pasta or choice, to al dente according to package instructions. Before draining water, reserve 1/2 cup of pasta water. In a large nonstick skillet, melt butter over medium heat. Once butter is melted, add sliced onions. Cook until onions are almost translucent. Add arugula in two additions. Arugula will decrease in volume as it cooks. Cook until arugula begins to wilt. Remove from heat and add 3/4 cup of cheddar cheese and 3 Tbsp of parmesan cheese. 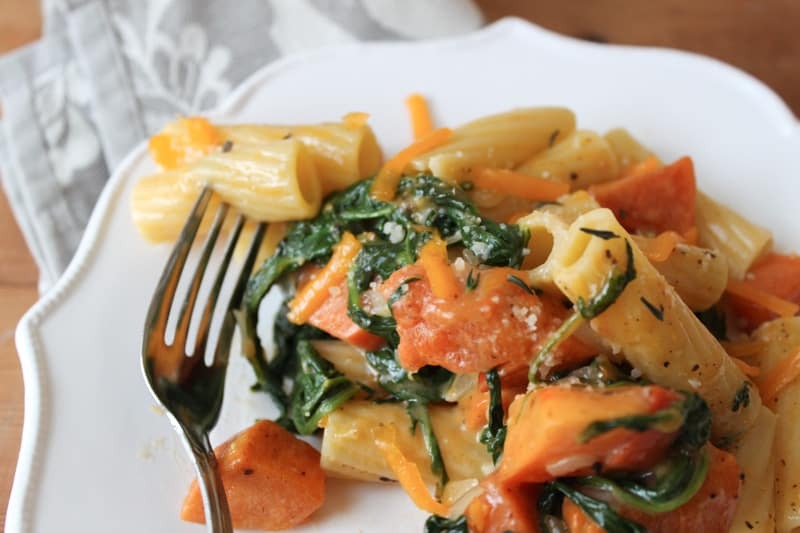 Add roasted persimmon and cooked pasta. Toss to combine. The cheese will melt and get sticky. Add 1/4 cup of reserved pasta water to moisten pasta. Season with salt and pepper. Continue to add reserved pasta water, 1 Tbsp at a time until pasta is well coated with the cheesy sauce. Serve immediately. Serve warm so cheese is ooey and gooey. If necessary, reheat over stove. Serve with grated parmesan cheese and remaining cheddar cheese. You always have such beautiful food. Love it! 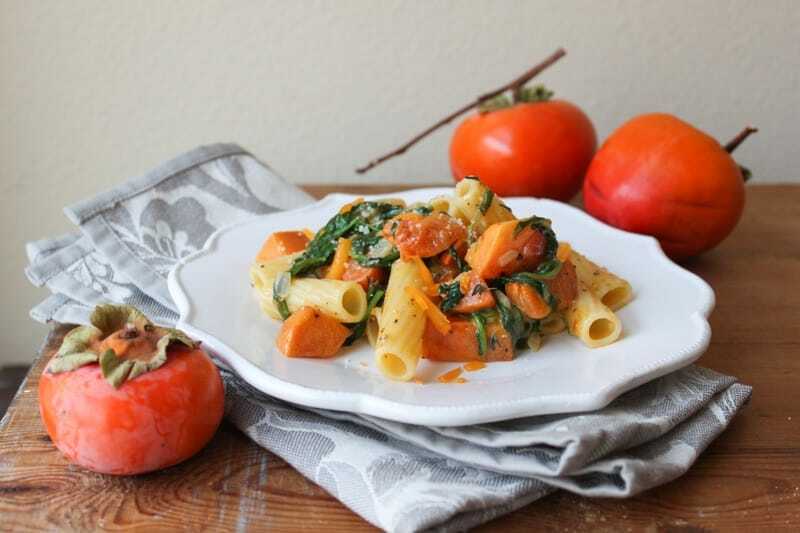 Looks beautiful – I love it, must try it, I’d never thought of using persimmon like this. This was wonderful! I came out to California from New York, where I eat locally and seasonally. A friend gave me five persimmons. This is the first time I’ve had them. I used spaghetti squash instead of pasta and goat cheese and aged Gouda instead of Parmesan and cheddar. I didn’t have thyme, so I used dried oregano. I really enjoyed this meal and I’d happily eat it regularly!